In 1942, a gallon of gasoline cost a mere fifteen cents and the average annual income was a whopping $1,880 per year. The world’s attention was focused on the global conflict of World War II. Iconic American musicians like Glenn Miller, the Andrews Sisters, and Bing Crosby were radio sensations. That same year, a modest accounting firm quietly opened its doors for business in Indianapolis, Indiana. It might have been hard to imagine then that more than seven decades later, the firm would still be in business. Perhaps few people could have foreseen that, over time, it would flourish and evolve into one of Indiana’s largest and most prestigious accounting and consulting firms; or that out of the 44,000 accounting firms in the US, it would be ranked the 59th largest, serving local, national, and global clients. 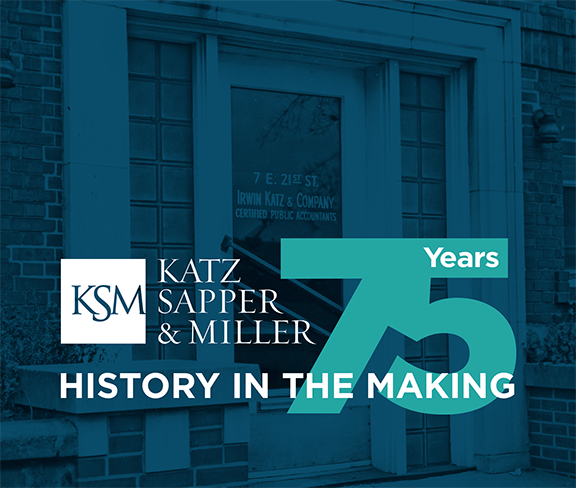 Over the course of seventy-five years, Katz, Sapper & Miller (KSM) has strived to maintain a close connection to its entrepreneurial roots. It continues to honor many of the traditions and old-fashioned values upon which it was founded. KSM balances this historical reverence with a progressive approach that makes its business relevant in today’s marketplace. Just how KSM continues to thrive is worthy of a closer look.